Maybe he should be referred to as the quiet man, because WBO welterweight titlist Terence Crawford 33-0 (24) is very much understated. He doesn’t say much and when he does you can barely hear him. In the ring he’s a certified hell raiser and when challenged or angered by an opponent, his sublime skills take over and he dominates. This weekend he defends his title against Jose Benavidez 27-0 (18) at the Chi Health Center in Omaha, Nebraska. Benavidez has accused Crawford of beating up smaller fighters. Terence says he’ll give Jose the opportunity to back up his words Saturday night and most likely — as it is with all of Crawford’s title bouts — he’ll size Benavidez up for a round or two and then proceed to beat him up and take him apart a little more with each passing round until it’s over. The reason I say that is because Crawford is so versatile. He has defeated upper-tier opposition and title holders fighting out of a conventional stance and fighting as a southpaw. Defensively, Crawford, going by the way he looks after his bouts, must be hard to hit because his face is seldom marked. Offensively, Crawford has more gears than any fighter in boxing and he’s quicker and a little bit of a bigger puncher than he is given credit for. Terence has more resources physically and processes information faster than any fighter we’ve seen in a long time. He has more ways to win and defeat elite fighters than any other combatant in the sport. He’s a natural fighter with a mean streak a mile wide and maybe the most underrated thing about him is that the punches of his opponents seldom go unanswered. Jose Benavidez is an outstanding fighter who is always in great shape and comes to fight. He’s 3-4 inches taller than Crawford at 6-2 and holds a three-inch reach advantage. In fact he’s one of the biggest welterweights in the world and his best punch is probably his jab. But he doesn’t have the speed or sophistication to apply his physical advantages against Crawford. Moreover, he’s never been in the ring with a fighter as lethal as Terence Crawford. Jose says he plans on making Crawford fight, and that’s exactly what Terence thrives on because he’s boxing’s version of the New England Patriots. Crawford doesn’t enter the ring with a mindset that dictates what he wants to do -no- he’s like the Patriots in that he finds his opponents vulnerability and forces them to fight from their weakness. Maybe the thing that stands out the most about Crawford is that we hardly ever hear a fighter call him out or challenge him. Anthony Joshua is the perceived number-one heavyweight in the world, yet he’s called out every day by his contemporaries the likes of Deontay Wilder, Luis Ortiz, Dillian Whyte and Tyson Fury. Canelo Alvarez and Gennady Golovkin are considered the top of the food chain among the middleweights, but a day doesn’t go by when they’re not publicly challenged by Demetrius Andrade, Billy Joe Saunders, Daniel Jacobs and Jermall Charlo. Even WBA 135-pound champion Vasyl Lomachenko, who is in the race with Crawford as boxing’s top pound for pound fighter, is issued challenges routinely. In fact, Lomachenko has been challenged by fighters he’s already defeated in Gary Russell and Jorge Linares. When is the last time a beaten Crawford opponent has asked for a rematch? Once Crawford beats them, they never want to have to think about him again. 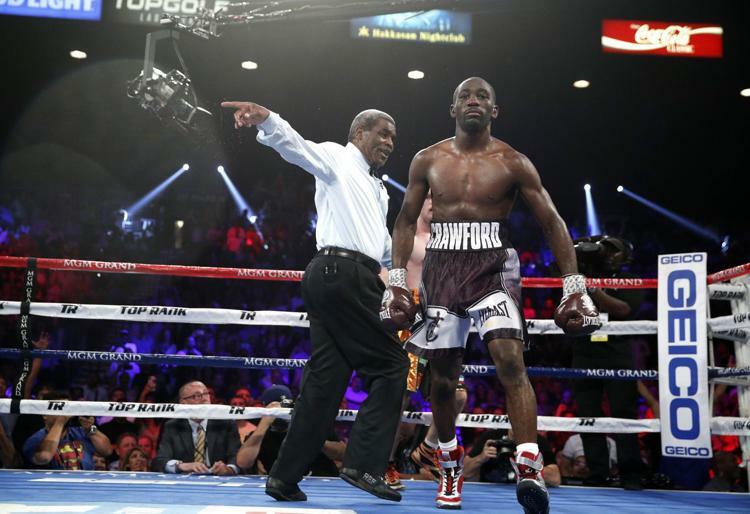 As the year 2018 winds down, which has been another banner year for boxing, Terence Crawford is in need of a super-fight. He holds the WBO welterweight title with Keith Thurman, Errol Spence, Shawn Porter and Manny Pacquiao holding the other alphabet belts. In the opinion of most observers Crawford ranks higher than all of them. But all we hear is Thurman wants to fight Porter again, Spence challenged by WBC lightweight titlist Mikey Garcia and Pacquiao seeking another easy win via potential bouts with Amir Khan or Adrien Broner…..and the band plays on and Crawford goes unmentioned! That is if you don’t count Errol Spence’s tweets, and I don’t. Counting down to Crawford’s clash with Benavidez, Terence is the least appreciated fighter among the top-10. He’s not a great interview nor is he a natural, say like Joshua, in front of the camera. Lomachenko is flashier and Golovkin puts his opponents to sleep….and those things grab casual fans more than Crawford’s technical brilliance and versatility. However, Crawford is a better fighter than they are and his killer instinct and coldness, showing no mercy to beaten opponents, goes virtually unmentioned. And if he beats Benavidez as convincingly as expected, his detractors will fall in line and parrot how Jose was just another undefeated bum who Crawford was fortunate to face on a big stage. Of course they’re wrong, but the boxing business is fickle. With Lomachenko, Canelo, Golovkin, Mikey Garcia, Errol Spence and Naoya Inoue all moving back and forth among the top ten, the debate is continually changing. But the number one spot has consistently belonged Crawford for the last two or three years and I question the acumen of anyone who puts anyone else in that position. It’s a matter here of substance over style.